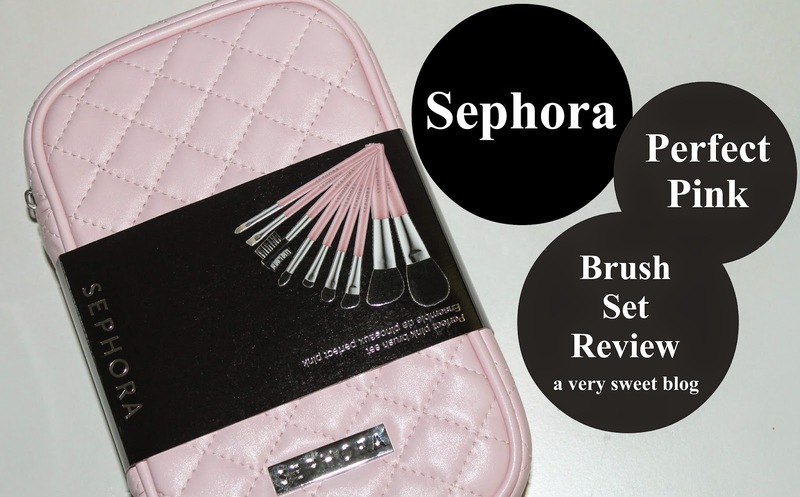 I recently purchased a makeup brush set from Sephora, called The Perfect Pink Brush Set and I'm super impressed with it! Some makeup brushes/handles are too long or too short, but these are a happy medium for me. It's considered travel size, but they're a little larger than that. The handles of the brushes, remind me of those hard Jolly Rancher candies (only pink). 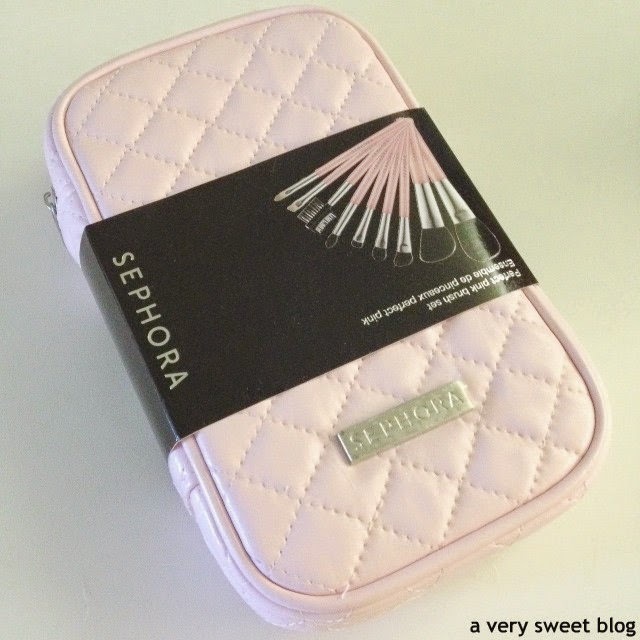 Each brush comes individually wrapped when you receive them and in a soft-pink, quilted, zippered case. Each brush is engraved with the type of brush it is (powder, angled, brow etc.) and SEPHORA on the opposite side. Each brush is a nice weight and most importantly have super soft bristles. The inside of the case contains a see-through pouch that can be removed (velcro), and that you can put your makeup in. They did a great job on the outside of the case, but I wish they would've put a little bit more oomph on the inside. But overall, it's a really nice set. So, those are my thoughts! Purchasing items like this online can be super tricky, because you can't feel the bristles of the brushes. So I thought I would do a review for you. Trust me, I've purchased some messed up make-up brushes online! You know the ones! The bristles fall out or better yet stick to your face & lips while applying makeup and while trying to wipe them blow them off your face. You end up removing all your makeup while doing so. DRAMA! But this one passes the Kimmy test :) Have A Great Wednesday! Sephora's Perfect Pink Brus Set is Sweet. What a gorgeous pink brush set! My mom gave me a rose gold set of brushes from Sephora for my birthday last year and I love them! You're right, buying online brushes can be tricky, but I'm glad to hear these brushes work well! What a cute brush kit and the case is pink my favorite nice presentation doll. I love that they come in a nice travel case and are super soft - what is more important than that? What a lovely brush set! I like that the size is versatile swell. This could definitely be a nice gift! I think we've all purchased some messed up makeup brushes online before Kim. So glad to hear these worked out well for you. They are certainly very pretty and the range looks like it covers the bases. Those are so pretty! I love the pink! I've always wondered if sephoras brushes were good or not because they always have such cute ones! i don't use these types of brushes on a regular basis but when i got done up once they felt so super soft against my skin. so glad these worked out! 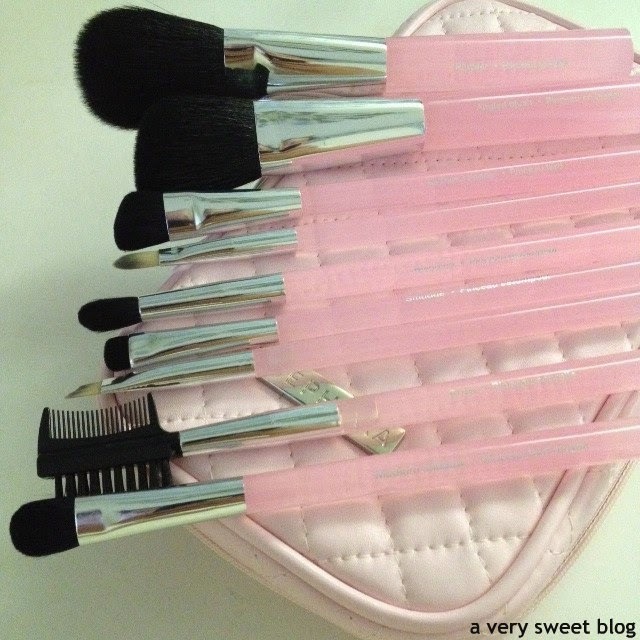 You got great pink brushes and it's great to hear that you're satisfied with your new purchases! Hi Kim, wow that looks like a really nice makeup brush set. I love Sephora and this one looks like a winner! Have a nice day. I am OBSESSED with brushes, my collection is getting out of hand. Probably just as well we don't have a Sephora in Ireland! This looks like a great little set, great to hear you are happy with it. Great! Recently I bought a brush and it's not good. If I happen to buy brushes soon, they will be from Sephora. Wow, I am impressed with your dedication to AH! :) I think they only time I stayed up very late for a show is when Oscar de la Renta worked with Galliano and the collection was shown around 1am (or later because they run late). What a beautiful set. Thanks for the review because I'm needing some new brushes. I haven't had much luck with brushes lately. I definitely know what you mean about those brushes with drama. I hate it when it sticks to your face; nothing worse than having to try to get it off and then it messes up the makeup after you spent time applying it. This make up brush set sounds great Kim....hope you are having a good week! I cna just picture you carrying the Anya Hindmarch Tony the Tiger bag, Kim! Ha ha :) On the subject of the brush set, the handles really do look like candy! I am due for a new brush set soon - I normally get mine from MAC but I will have a look at Sephora now. Omg Kim, I have the exact brushes but my pouch is a different design. My sister got it for me as my birthday present. They're so handy and very sturdy. Love them! These look great. I love the color of the handle and the case. I know exactly what you mean by the terrible brushes that shed. Ugh! And the problem with buying online is that you never know. love your describ of brushes <3 thank you ! I`m here first time and really love it! I wanna to ask you how about follow each other? have a inspiring day hun! What is it with sets that are that much more adorable? I love this cute little pink set! This is the PERFECT brush set! I am drooling over here! to look beautiful is there. Such a pretty in pink brush set. Very cute! Such a pretty design! I actually just started using makeup brushes - I usually always prefer to use my fingers - and these look like a really great investment! Sounds like an amazing set! Thanks for sharing with us :) Following you on Bloglovin & GFC - can't wait for future posts! this one looks like it would fill all my voids. i've been browsing over the years for new brushes, but they are so freaking expensive. Very nice make-up brush set. The case looks so pretty. I also look forward to Anya Hindmarch's Fashion Show. It is so fun, creative and just out of this World! Both the brushes and the design of the set look perfect... there is something so classic about pink package when it comes to beauty products, right? I love pretty things and this kit makes even more fun and pretty make-up time. The handles indeed look like candy. Oh the padded pink case on this set is so girly and fab! I'd fall for it. I have been a fan of Smashbox brushes for ages and unbelievably I have not had to replace them because they are of such good quality. I have a brush set that I ordered from Amazon, but I never know what to use all the brushes for! So sometimes I feel like I wasted my money!